We've broken down our lists of the top systems for charities into two categories: CRM (constituent relationship management) and donor management systems. In general, CRM systems like Salesforce and Microsoft Dynamics are built primarily for sales organizations, and you will need to adapt them for your nonprofit's environment. These systems are often very powerful, customizable, and scalable, but they need some technical skills, a development partner, or a special nonprofit-specific template to get up and running. Donor management systems are marketed specifically as CRM systems for nonprofits, and come pre-loaded with the data fields that nonprofits use, such as donors, volunteers, and fundraising campaigns. They work out of the box for nonprofits, but are often more limited in functionality and are less customizable should your charity want to adapt them for new activities. Features: For a "vanilla" CRM system, this will come down to whether it has a template made for nonprofit organizations that fits your processes, or whether you are prepared to spend the time adapting it to your needs. For a donor management system, this will depend on how well its particular features fit your needs. Cost: This includes licensing, subscriptions, and any third-party setup involved. Cloud versus on-premises: Many CRM and donor management systems are cloud-based, saving you money on hosting and maintaining your own servers. Security is also taken care of. A few systems can be hosted locally if your nonprofit has concerns about where its data is being kept or whether a third party has access to it. 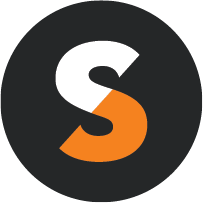 Integration: Your organization might have other software such as email applications or payment platforms. Your system should be able to integrate these functions if you want to get the most out of it. 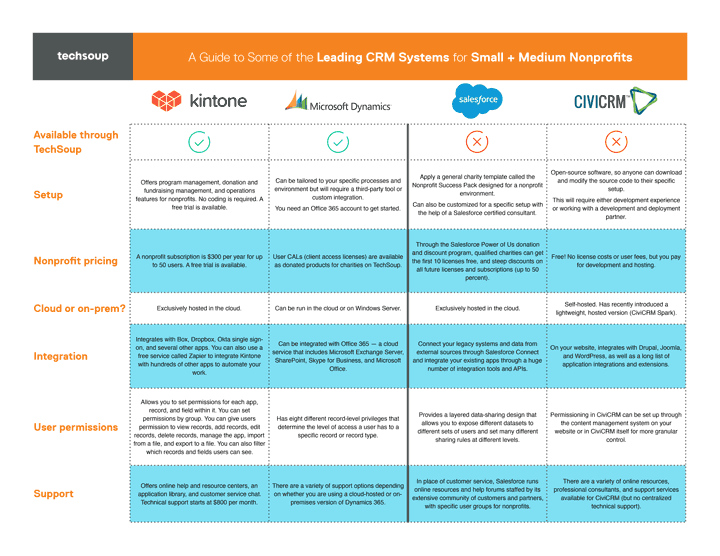 We've listed some of the top CRM systems (first PDF) and donor management systems (second PDF) that include donated licenses or special discounts for nonprofits, alongside features and cost. 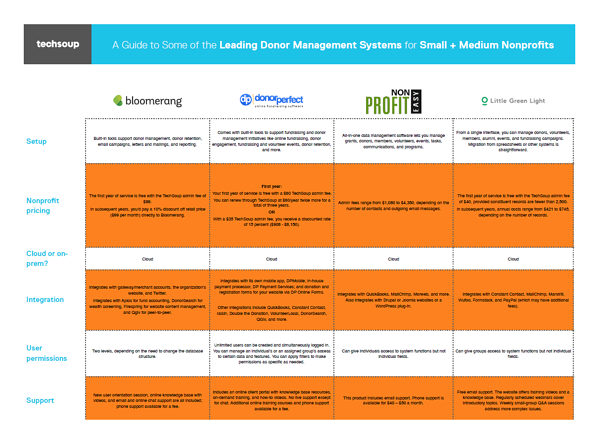 Click on the preview images below to view the PDFs: A Guide to Some of the Leading CRM Systems for Small + Medium Nonprofits, and A Guide to Some of the Leading Donor Management Systems for Small + Medium Nonprofits. Check out the full list of TechSoup's donor management tools and CRM offers (for nonprofits of all sizes, budgets, and needs). For a comparison of CRM systems, donor management systems, and other types of systems, check out Types of Databases for Managing Constituents. Learn more about CRM options in A Few Good CRM Tools. Get more in-depth reviews and other valuable information about donor management systems (report from Idealware). Learn more about CRM integration (report from Idealware). Access TechSoup's Guide to Dynamics 365 Products and Licensing. This blog post was originally published on the Charity Digital News blog.